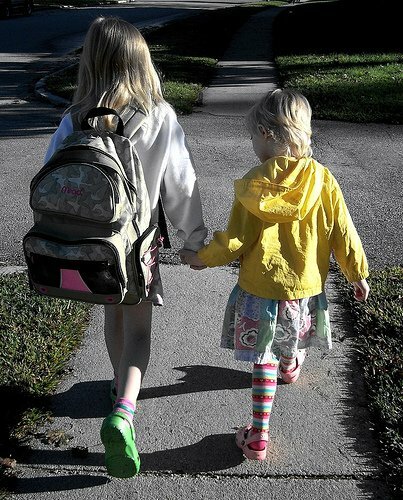 Pat Flora, director of a growing preschool, was searching for a way to deal with the transition to three, morning preschool classes instead of the regular two mornings and one afternoon classes. Pat and the St. Andrew Church staff knew they couldn’t build permanent walls, but needed a way to accommodate the needs of the parents and students. Pat contacted a Screenflex consultant. 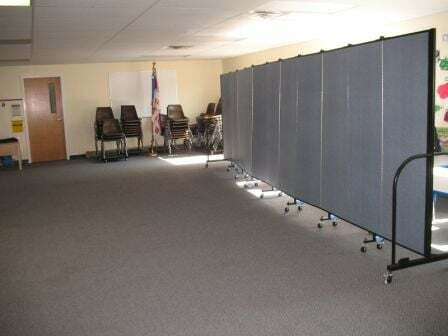 After listening to the school’s needs, the Screenflex consultant suggested a Standard seven-panel portable room as the solution to their prayers. St. Andrew Lutheran Preschool successfully provides early childhood education for 107 students ages 3, 4 and 5 as part of their educational ministry. All teachers have degrees in early childhood and are dedicated to providing a challenging and developmental learning experience for all children. In the fall of 1980 St. Andrew Lutheran Church finished construction on their multipurpose sanctuary and worship began. With a large focus on children and families, continual growth made it necessary to expand and build a three level educational wing in 1998. St. Andrew celebrates their twenty-seventh year of educating students. Earlier this year the church gave the preschool space to share with other ministries allowing the school to add another four-year-old morning preschool class. Pat Flora, the preschool director, was searching for a way to deal with the transition to three-morning preschool classes instead of the regular two mornings and one afternoon classes. Pat and the St. Andrew Church staff knew they couldn’t build permanent walls, but needed a way to accommodate the needs of the parents and students. Pat contacted a Screenflex consultant. After listening to the school’s needs, the consultant suggested a Standard seven-panel portable room as the solution to their prayers. Students and teachers enjoy their new room and like the ability to display artwork and tack up other school related projects. In the afternoon, the room divider hides tables and chairs to enable the other ministries a space for their activities. Students and teachers enjoy their new room as well as the ability to display artwork and tack up other school related projects to the movable panels. In the afternoon, the room divider hides tables and chairs to enable the other ministries a space for their activities. These room dividers are so handy. They move easily and the children love using them to display their art work. In the afternoon it only takes five minutes to roll the divider into place to get the room ready for the other ministries that share the room. Safety was a big deal when we were looking for a divider. We wanted something secure that would not tip. During the school day we use the dividers to shield off the area where the chairs and supplies used by the other ministries are stored from curious preschoolers. The mobility and flexibility of the divider really suits our needs! Thank you St. Andrew! We are so glad to hear that you are enjoying your dividers.